^^^ Great times, especially the ports-of-call. Now Service Manager for Photonics Equipment company. ^^^ Now Electrical Engineer with BP Pipelines - Safety and integrity of pipeline facilities nationwide. ^^^ Ret USN in 4/95. My wife Marilyn and I have retired to the Gulf Coast; Corpus Christi, TX. *** ETR2 - I was an ET (OE Division) aboard the Okie City from November 1967 to November 1968 until I transferred to the Providence CLG-6 Yokuska Japan for the "ride" back to the states. I was a radar tech and also worked opn the repeaters on the bridge, flag bridge and CIC. I learned not only how to read backwards but to write backwards as well. It was my first duty station out of "A" school. 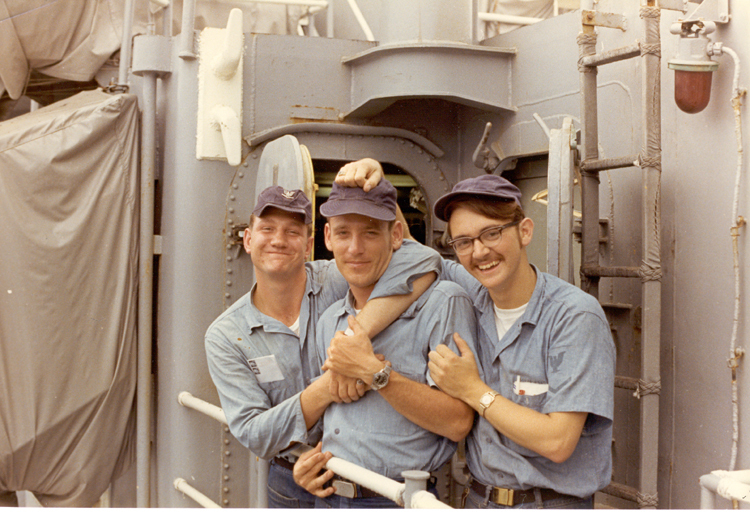 I often look back on my time aboard ship and in the Navy. I am now retired from federal service and have started a new career (same type of work - electronics - only newer!) with the state of Colorado. I guess once on the gravy train - always at the trough. I first came aboard her when she had just come out of the yards and was tied to the buoys in San Diego harbor as all ships going through REFTRA. Oh how exciting that was and how scared I was. When I landed at the airport and took the taxi to 32nd St. pier to catch the "quarter snatcher" to the ship I also felt so proud and honored. I remember seeing her for the first time in the bright sun and tied to the buoys. Wow what a site for a young 18 year old. I miss the night when I was assigned the "mail buoy" watch. I knew that such a thing didn’t exist as I grew up as a Navy brat. But, I remember how clear the night sky was and the billions of stars. I've come close to seeing those stars in the bush in Alaska and on the mountain tops of Colorado, mostly I see them over and over again in my mind like it was yesterday. *** ETR2 - OE Division, Maintained radar and ECM equipment. *** ETN-3 - OE Division - UHF Radio and Navigation Electronics. *** ETR2 (SS) - RC Division REACTOR CONTROLS. Mike Nealy and Pat Grady were good friends, many more. Put the Sub together. HAGDORN, Jerry - Virginia Beach, VA 91-92 mail *** ET3 - SSN-723 was my first boat in the navy, and of all the ships I've ever been on since she had the tightest, hardest working crew. ^^^ Married 14yr with 2 kids. Now LCPO of Training Technologies Dept at Training Support Center Hampton Roads (TSC-HR). *** ET1 - Beacon Keeper (TACAN Tech), UHF/VHF, Crypto. *** ETN2 - CE Division / SSC-6 SatCom. Terrific tour of duty with some great shipmates! ^^^ Working in Medical Imaging since my 7 year hitch. Tinker with 60s/70s cars in my spare time. ^^^ Married with 4 grown children. Degree in Elementary Ed., taught 5 & 6 grade for 20+...now School Technology Specialist -(LAN/WAN) systems operation and mtce. ^^^ I am retired from gainful employment and currently live with my wife in a little rural community about 20 miles north of Spokane, WA. *** ET1(SS) - Reactor Controls Division. Fondly recall my time on the OK City. During the time of CDR Polefrone. My chief was ETC(SS) John Thomas. Great experience I will never forget. Buds were: Wisecup, Wark, Grant, Gerard, Pflibsen, Sorrensen, Mathis. I know there were more but names elude me. ^^^ Today I am an operations manager for Hubbell Power Systems and have been with the company for 12 years. I have a wife (20 yrs) and two kids. My son starts college this year and my daughter is a Junior in HS. *** ETR2 - OE Division, worked on the AN/SPS30 Radar. Retired after 22 years as ETC in '89. *** ETN2 - OE Division - worked on communications gear, LORAN, TACAN and URD4 direction finder. ^^^ I'm semi-retired but still teach computer networking in the evenings and consult for the company I helped start. *** ET Chief - Communications, OE/CE Division. ^^^ Retired in Nampa, Idaho. 11 year volunteer with Nampa Police Department Property Crimes Division, 13 year volunteer with Northwest Nazarene University and avid RV camper, fisherman. ^^^ Married Tomoko (Aramaki) Rader in January, 1966. Retired January, 86 as ETCM. *** ET2 - OE Division, then Com7Flt staff in CE Division. Retired 1991.